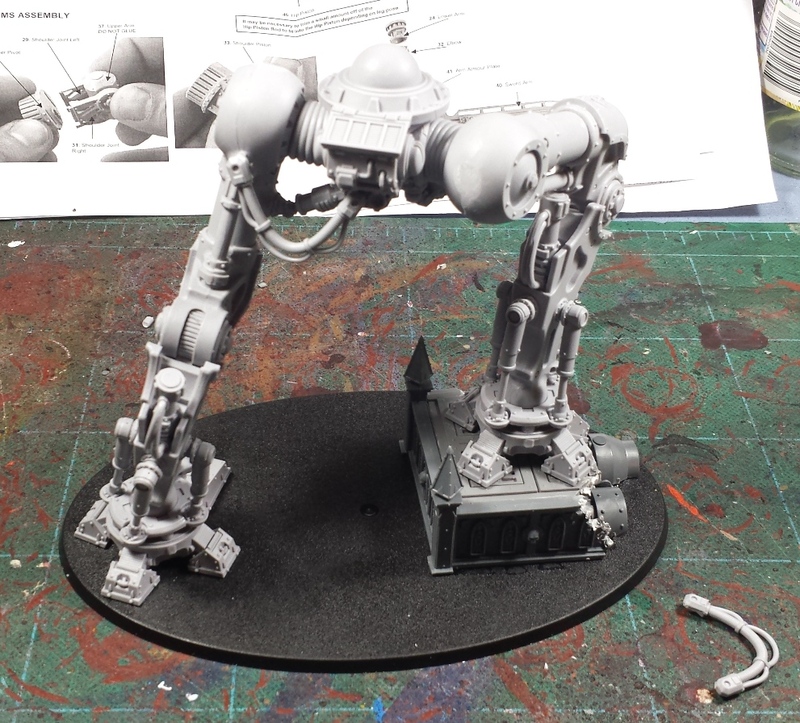 Mordian 7th Regiment: Adeptus Mechanicus - Knight Castigator build begins! 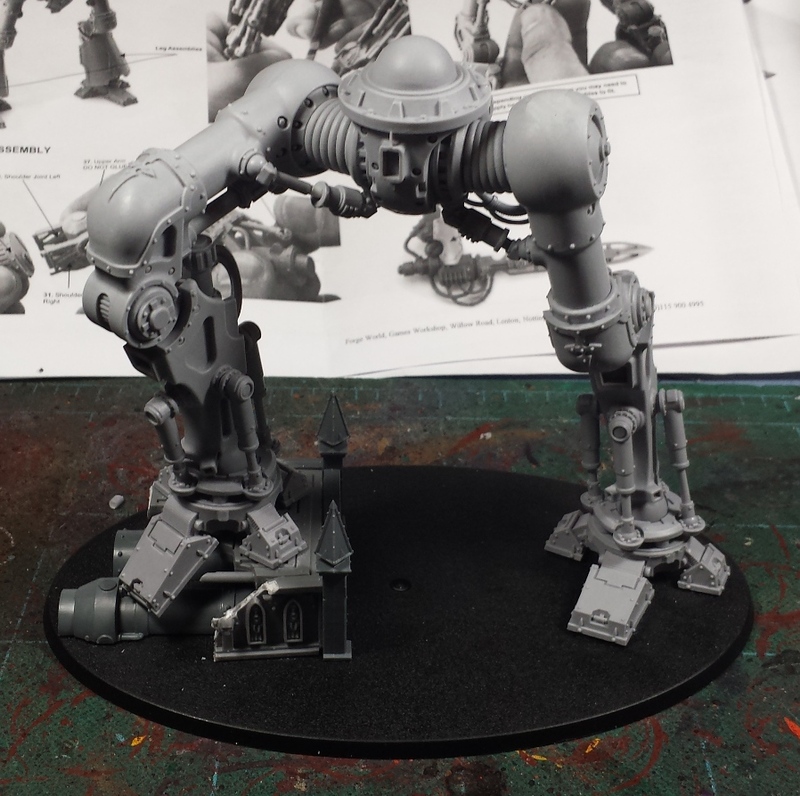 Adeptus Mechanicus - Knight Castigator build begins! After getting home on Sunday late afternoon, I immediately pulled out all the FW goodies and got 'em into some warm soapy water for an overnight soak. Yesterday morning I got them all scrubbed and laid out to dry and got a jump on assembling the Castigator that will be used as the Baron for my knight household! I knew from the outset that I wanted to have the model be in as dynamic a pose as I could manage, after being disappointed with the somewhat static leg positioning of the paladin/errant kit I was delighted to see that the FW kit allowed for all sorts of posing options! I started off by building a little damaged pumping station that I could have one foot standing on, then got started posing and pinning until I came up with the stance shown. After that it was a surprisingly simple matter of attaching all the various pistons and cables, most of which went on very easily, though I did need to extent the hip piston on the upraised leg slightly. On the rear however I found that some of the cabling will require a fair bit of hot water bending to allow them to attach to the extended pose, but that should be fairly painless. The way the instructions for the upper torso and weapons are written seems to indicate that the left-arm gatling cannon has much less of a range of motion available than the right-arm sword, so I kept the left leg straight and out of the way in order to give the ammo feeds as much room as possible. The intent is to have it splayed around to the left a bit and the sword in a sweeping motion up and over the raised right leg. We'll see how that goes, I suppose! I'm still not entirely sold on the scale differential between the Cerastus pattern knights and the plastic paladin/errant kit but with the Castigator intended to act as the Baron for the household I thought it would be appropriate for him to be a bit more imposing than his squires (represented by the two paladins). Nevertheless, he's gonna be BIG! Hoping to get the torso and weapons built over the next few days - assuming I ever get out of work. Being gone for a week means that I have some drifting piles of email to wade through and work to catch up on. Oof! You soak your FW models overnight? Oh oh. I usually just use dish soap and warm water. Am I doing it wrong? Nice scale shot there, and pose looks great as well! Lovely thing, I am sorely tempted, and its good to know that this one can be posed..
Ah thanks Karitas...I just remember someone mentioning that it was a good idea to wash them off with soap and water. Didn't know if I was also supposed to be soaking them! Looking good mate! I hope to be receiving my Knight Lancer in the next few weeks. I love the idea of the little pumping station. @Karitas: Indeed, would love to see what you'd do to convert up one of the FW knights into a Khornite monstrosity! @Davetaylor: Nice! Seems like the only difference between the Castigator and the Lancer are the weapon arms and head - the torso and legs are common to both. Really pleased with all the posing options (though it does have a reversed-knee arrangement which is at odds with the plastic knight's leg style). Really glad we had a chance to meet up over GenCon! 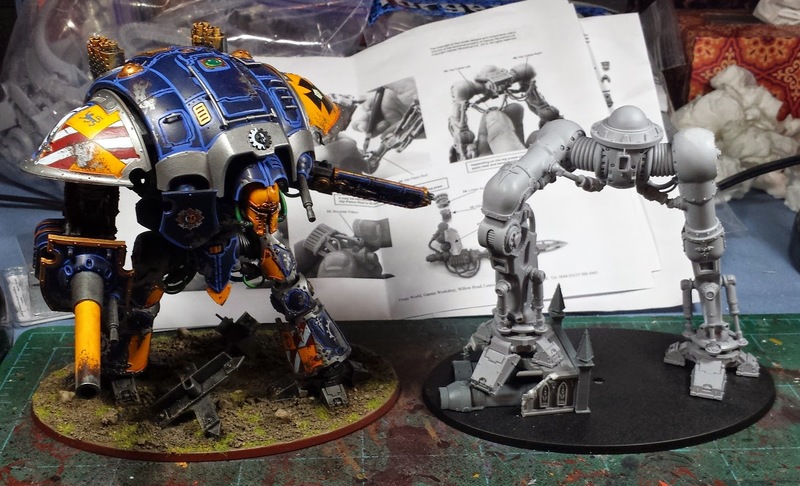 Gosh, that is a heck of a lot bigger than the GW model, its got to be getting on for the height of the Warhound once you get the torso onto it. I would have expected the size differential to be a little bit smaller so that they went together, especially as it is so much more slender looking. Great pose mind you, its going to look fantastic once you've got the torso on and its striding forward like that. That leg posing has me excited! @Andrew: Indeed! Now that I've gotten it a bit more assembled (pics soon) it has about the same bulk as the plastic knights, it's not nearly as broad across the shoulders. @The Eye of Error: Thanks! I've really enjoyed building it so far, more to come!